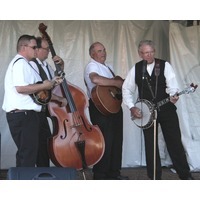 Originally formed in 1989, Bluegrass Fever has developed a solid reputation as one of the most crowd-pleasing bluegrass bands. The band migrated to Vancouver Island from Ontario a number of years ago, when banjo wizard Barrie Hemmings (of the band's original line-up) moved to Victoria. Barrie is master of both the three-finger and clawhammer banjo stylings--you can't miss his hard-driving sound when you hear the band. The band was re-assembled with guitarist Bob Johns (known on the Island for his years with the popular Back Forty Boys), Guy Langlois (a highly talented upright bassist from Yellowknife, NWT), and Kim Turner--she's our marvel of the fiddle, mandolin and harmony vocals.